Symphony #3 "Poems and Prayers"
To all my readers who believe I can't review anything but Brahms. Sono Luminus is a company that continues the Dorian legacy of great programming and great sound. Every few months, they send me a really interesting CD/Blu-ray combo pack, and this month, I got two. Both are outstanding, full to the brim with music, and entirely worthy of a listen if you care about music generally. 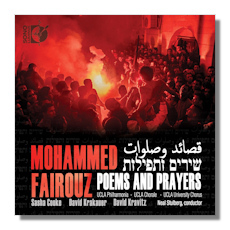 The first disc I received is devoted to Arab-American composer Mohammad Fairouz. In an age where hot-shot conductors and artists are hurriedly gathering Middle-Easterners to play music together (albeit generally well and with good intentions), it's refreshing to see a label pay tribute to someone who is writing music. The major labels would never do it, but credit Sono Luminus for being adventurous. I don't own a Blu-ray player, but if you do, you get both the standard CD and a Blu-ray copy, which should please general listeners and audiophiles alike. The music is equally universal, which I daresay is more to the point. This is not just an "East Meets West" project by any means. Nor do you really need to get political. Yes, the Concerto is reflective of the conflicts recently in Egypt, and yes… the Symphony and Concerto alike interweave Arabic and Israeli music, but really, we are here for the noise, and it is glorious. In the concerto, powerfully framed by the UCLA forces, we have a really unique statement for the B Flat clarinet; one that I suspect could enter the repertoire at any time. Soloist David Krakauer is utterly unfazed by the distinctly Eastern sounds he is required to produce – he also features prominently in the Symphony – and the result is completely idiomatic and engrossing. Whether it succeeds in meshing the two cultures is up to you, it certainly does seem to showcase these traditions well, and the clarinet seems an ideal vehicle. Rhythmically challenging and packing a lot into 10 minutes, this one-movement work sounds terrific here, and I expect to hear it again soon. On the other hand, the Symphony is huge, with a nearly half-hour finale. From the first notes, the chorus makes a fervent entrance, and the drama never really cools off from there. The massed choral forces of UCLA make a spectacular impression; although diction isn't always clear, this is not easy music to sing. Sono Luminus provides the listener with all the texts – in English as well as the original poetic language – and extensive notes on both pieces. Again, the intention to marry both cultures is clear, but on musical grounds alone the effort is so emotionally engaging that the political subtext seems almost unnecessary. Doubtless there are many who would disagree, and it must be said that understanding the context is indeed very moving and completely heartfelt. On a final note, the conducting is terrific here, the orchestral contributions superb. Sasha Cooke reminds me why I like mezzo-sopranos so much in this kind of piece, and David Kravitz is similarly inspired. Some might raise their brows at collegiate forces coupled with such a highly charged subject matter. I did, and I stand corrected. This is triumph, and arguably important on many levels.